While less costly and easier to install than other options, the concrete is prone to cracking and heaving and will require repairs or replacement in the future. While a concrete slab is more affordable upfront, the long-term costs for repairs and/or replacements will almost always outweigh the initial savings. Concrete paving stones offer superior strength and durability to poured concrete. They are 4 times stronger than a concrete slab and will not crack due to the earth flexing or settling. 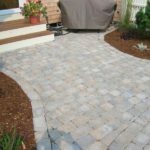 If the ground does settle or move, pavers can simply be pulled up, the ground leveled, and the pavers put back down again. 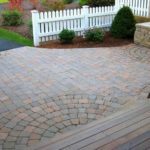 If installed correctly, most pavers come with a lifetime warranty. 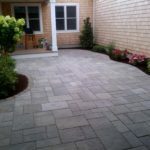 Brick pavers are very similar to concrete pavers in style and installation. The materials and labor for brick are slightly more expensive and they are more prone to chipping and cracking. 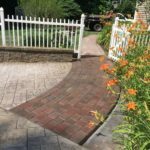 However, a properly installed brick walkway will last a lifetime. Natural stone is beautiful and timeless. 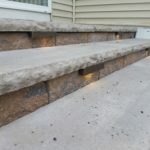 The cost of materials and labor makes natural stone the most expensive option for your new walkway, but an option that will look great and last for a very long time. 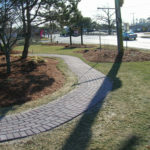 A commercial walkway is simply a walkway installed at a commercial property or along a roadway or parking lot. 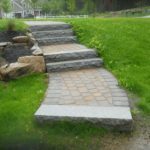 While these walkways have certain requirements that must be met, they serve the same purpose as a walkway you would have installed at your home. These walkways are often constructed using poured concrete. 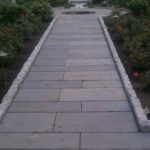 If you have a commercial space and you are looking to install a walkway, we urge you to give us a call and discuss a concrete paver walkway. 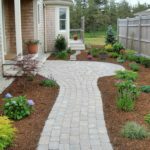 A walkway is simply a means of connecting different living spaces in your yard or transitioning you and your guests to different areas of your outdoor space. Are you looking to keep a lot of foot traffic off your lawn? A walkway is the way to do that. 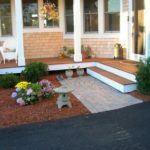 Whether going from your driveway to the front door, house to your patio, or from the patio to the pool area, residential walkways do not have the same requirements as commercial walkways, we have found over the years that a walkway width of at least 48” is ideal for creating a functional, effective walkway. 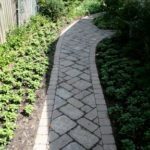 When looking at the design and layout of your walkway, there are several options as to how you can build your walkway. Walkways can be built as a curving pathway or you can keep all of the lines and angles straight. 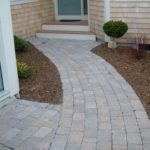 Your walkway can flare out to meet your existing steps or patio space. 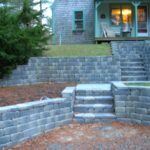 If your land is uneven, then steps will need to be incorporated into the design. 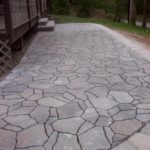 These are all design ideas and options we will discuss as we work with you in creating your custom walkway. What if my land is uneven? 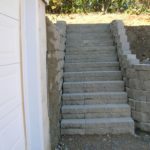 If you land is uneven, we may need to incorporate steps and walls to accommodate the existing conditions. This is something we will discuss with you when we do our initial on site consultation. 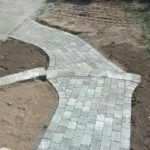 What is the process for building out our custom walkway? 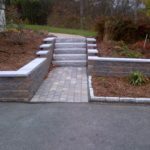 As with every project, we will start with an on-site consultation to go over your vision and goals for your walkway. 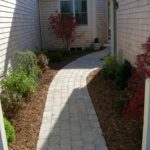 Your walkway needs to be designed around your lifestyle to make it work perfectly for your needs. 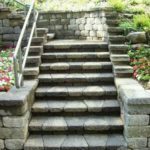 We will take measurements and pictures of where you want the walkway installed and from this we will work on a design with you. 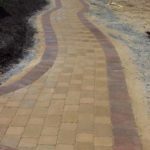 Once we have finalized the layout of your walkway and reviewed some ideas for the materials you would like to use, we will visit a local supply yard with you to go over all of your material options and make sure you select exactly what you need for your project. 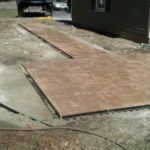 The next step is to mark out your walkway before construction so that you can see how everything will be laid out and then we will build your walkway. 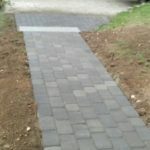 When we are finished, the area will be left clean and neat and your walkway will be ready to use. 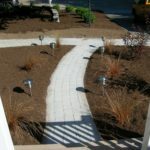 As always, we spread soil and seed over any disturbed areas and the edges of your new walkway as a finishing touch. 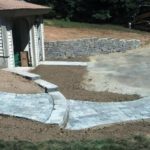 Do I need a building permit for creation of my custom walkway? When creating your custom walkway a building permit is not necessary. However, it is wise to check with your homeowners’ association because they may certain rules or guidelines you need to follow. 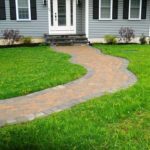 Will you design my walkway as well as install it? 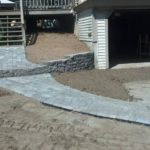 Contact Sheridan Landscaping for a free estimate on our walkway designs and installations at (774) 413-5012 or fill our contact form to get immediate assistance.